Patients can be all over the spectrum with regard to age-related decline in memory. At what point does mild cognitive impairment progress to outright dementia? Like a retired cop who was 73 when he came under my care. He had high blood pressure, Type 2 diabetes and high cholesterol. All were under control with the help of medicines he was good about taking. Here's how our typical visit would go. "Any problems today?" I would ask. "Nope," he would answer. "Everything's fine." During our first visit he told me that he was an early morning mall-walker, part of an exercise group. To me, this was a good sign physically and socially. I asked how his wife was. "She made me promise to give this to you," he said. He unfolded a piece of lined memo paper with neat cursive handwriting. On it was a list of his medications and their doses; the ones that needed refilling were starred. There was also a question about pain in his right knee, and a suggestion to check his hemoglobin A1c, a test used to monitor blood sugar control for people with diabetes. This all seemed reasonable enough. But I wondered why if he had knee pain, he needed a note from his wife to tell me about it. "What's going on with your knee?" I asked. "Not much. I guess sometimes it's a little stiff," he offered. I liked the man. He was affable and pretty typical of my older male patients: stoic about all things medical, and unlikely to complain in response to an open-ended question. They tend to live by the motto, if it ain't broke, don't fix it. I made a mental note about him: not forthcoming with medical complaints. In his chart, I documented that he'd brought a note from his wife and what the issues were that she'd hoped I would address. The comment about his wife's note was to jog my memory about this dynamic at any subsequent appointment. At this point, you might be thinking, "What kind of guy needs a note from his wife to remind his doctor about knee pain?" I know I did. I saw him several times over the next few years. Each visit followed the same pattern. I'd ask him how he was. He'd always answer, "Just fine." He always had a note from his wife that would itemize his medicines necessary refills, and usually include a question or two about testing for his chronic conditions. I looked forward to having him on my schedule. He was an easy patient, never taking more than his allotted 15 minutes. Each time he'd come, we'd have a quick, pleasant chat and then "take care of business" following the outline from his wife. His visits were a model of efficiency. And that was a problem. A doctor has a sixth sense, or should, that when things are going too smoothly there's probably more to the story. Four years after I first met him, he began bleeding from his gastrointestinal tract. He was hospitalized twice. We couldn't find the cause of his bleeding. But the health crises sent him into a profound delirium that left him unable to identify where he was or recognize his wife and other relatives while in the hospital. Geriatricians have long realized that there's a strong correlation between an episode of delirium like this and underlying dementia. Even in patients without dementia, becoming delirious in the hospital often leads to persistent cognitive impairment (errors in memory, speech, judgment, or calculation) that lasts up to a year. After his third hospitalization for bleeding, my patient had surgery to remove the part of his colon that seemed to be the cause. This time, with the added fog of anesthesia, he deteriorated so badly that he wound up in the intensive care unit for days. It was a harrowing time for his wife and their children. Fortunately, my patient weathered the ICU and survived his operation. After a several weeks at rehab, he returned home and resumed mall-walking, household chores and even driving. Some things changed. After that, his wife came with him to his office visits. Her lists of questions also grew longer. And then during one routine visit, she remarked, "You know, he's been given a diagnosis of Alzheimer's." This news didn't totally surprise me. She'd decided to have him evaluated by a neurologist because of his persistent problems. Still, her comment made me feel guilty. I wasn't certain why, so after the visit I reflected on it. It occurred to me that his wife's comment made me feel like she was criticizing me for missing her husband's Alzheimer's. The truth is, I hadn't wanted to look. The red flags had been there: stereotypical visits with nary a complaint, little regard for current events and limited memory of our previous encounters. In retrospect, I realize that my patient was adroit at masking his dementia. He was still capable of small talk. Since I didn't probe very hard, I wasn't going to find out the degree of memory loss that he'd already suffered. Of course, his wife's notes should have been the biggest clue. 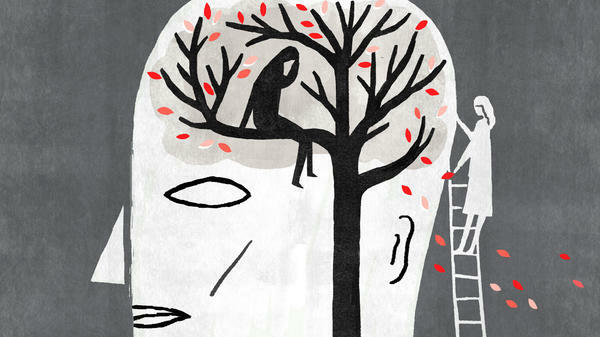 Labeling patients with Alzheimer's can be devastating. It's telling them that they have an incurable, progressive illness that won't only destroy their mind but in all likelihood ravage the lives of their caregivers as well. I hadn't wanted to inflict this diagnosis on my patient and his family. I was wrong. In hindsight, the diagnosis would have benefited them in at least two ways. Most directly, knowing that the man had some degree of dementia would have helped us all anticipate that he was at risk for big trouble in the hospital. Secondly, an earlier diagnosis of Alzheimer's would have given his wife more time and knowledge to care for her husband and plan for the future. Even when we doctors can't cure a patient, we should aim to provide families with the right resources and information to help them. Too often I think doctors fail to do this because we're so focused on what's happening at the moment during our in-person visits. After my experience with this patient, I'm trying harder to look beyond what's right in front of me and examine each patient's living situation and capabilities. Though it's tempting and easier, I no longer settle for "everything's fine."